Cedefop report finds that to best serve individuals, validation of non-formal and informal learning must take experience of companies into account. Most of the European debate on validating non-formal and informal learning focuses on how such mechanisms are organised within national education and training systems. Meanwhile, many companies systematically assess employees’ competence and skills, mainly for purposes of recruitment and to formulate personnel management and training strategies. A new Cedefop study, now out in print, has found that most such in-company assessments are not linked to national validation schemes. As a result, while they are of undoubted value within the company, those undergoing such assessments may not find them useful when seeking alternative employment or further learning. Companies also do not focus equally on all staff: competence assessments mostly involve executives and technical specialists. Moreover, company size considerably influences the way this exercise is carried out, or indeed whether it is carried out at all. 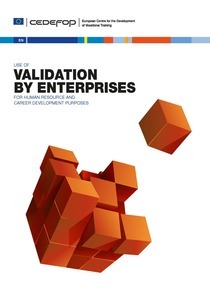 Based on a survey of 400 enterprises, 20 in-depth case studies of companies* and interviews with human resource experts in 10 countries, the report, Use of validation by enterprises for human resource and career development purposes, analyses the reasons why competence assessments take place, the standards and methods applied, the employee groups targeted and the way results are documented and used. Cedefop has been actively involved in validation since the mid-1990s and has been instrumental in transforming what was once a topic of interest to a few experts into a core issue of European and national lifelong learning policies.